While people looking at the above crop glyphs may say, 'Oh what pretty flowers!" 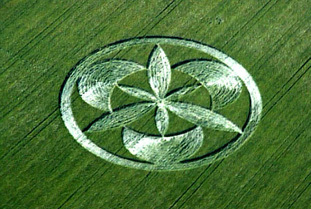 we see a greater message in the patterns, symbolizing the spiritual growth of mankind. It has been long known that the daisy petals are part of the 'flower of life'. 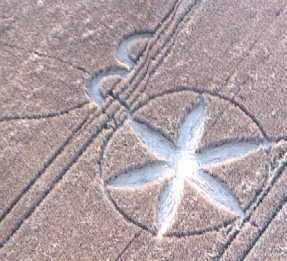 The two examples of daisy-like crop glyphs suggest closed eyes; the one from the 15th shows 3 semi-circles which look like closed eyelids as well. 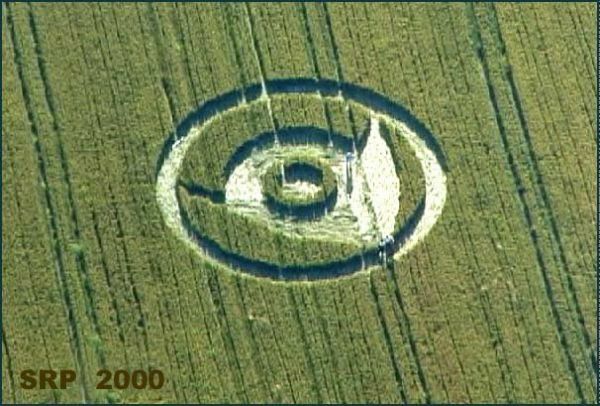 while the crop glyph below from July 25th, 2000 shows a form like an open eye or aperture of a camera. The reasons for these interpretations are explained further below. North Down, nr Beckhampton, Wiltshire. Reported 25th July, 2000. Several other aperture-like crop glyphs have appeared recently, which I wrote up on the Southfield page. An aerial shot by Steve Alexander Homepage. Copyright 1996. 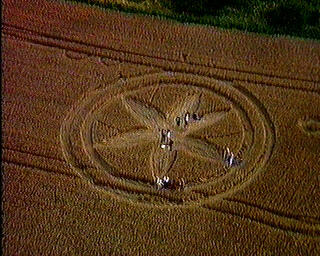 Unfortunately, the original page http://cropcircleconnector.com/archives/1996/sil96.html is only available to be seen by paying members. I did a web page about the Eye of Horus in 1999, after I had some dreams about my eyes being open permanently which rather freaked me out because I like being able to shut my eyes when I sleep and thinking that I might have to 'see' everything all the time is a rather scary thought. From the higher heavens the Elohim and the B'nai Elohim continually oversee creation through the Father's Eye of creation and the Eye of Horus. They are the "Fathers" who watch the formation of the Brotherhoods of Light who are pre-created in the heavens. They align their eyes with the eye network patterns of the individual species for the eye is the opening to the code of creation. As Man begins to unlock the Mysteries of the Great Pyramid in relationship to biblical teaching he will understand why Enoch told me that within the Great Pyramid, within a different energy field, the biochemical functions of the body of Moses and Jesus can be found, for they are the two highest incarnate manifestations of within this present cycle. Enoch said they are within the Pyramid to show that the Pyramid is the Eben Shettiyah, the foundation stone, or the resonance eye for soul manifestation connecting the Office of the Christ with this planet. And when the Pyramid is reactivated they will return as the capstone. They will return to demonstrate the scientific and spiritual unity of all Ascended Masters." The EYE OF HORUS has a very specific meaning. The eye is represented as a figure with 6 parts. These 6 parts correspond to the six senses - Touch, Taste, Hearing, Thought, Sight, Smell. These are the 6 parts of the *eye*. The eye is the receptor of *input*. It has these six doors, to receive data. The highly stylized eye of the falcon-headed solar and sky god Horus (the Latin version of Hor) is associated with regeneration, health, and prosperity. It has become commonly associated with esoterica and the occult. It is also called the udjat eye or utchat eye, which means "sound eye". The udjat is depicted as a human eye and eyebrow as they would be seen looking at a person full-faced. The eye is decorated with the markings that adorn the eyes of hawks. Each piece of the udjat can be seen as representing a fraction of the descending geometric series 1/2, 1/4, 1/8, etc., put together they make 63/64 or approximately 1. The entire eye measured 1 heqat. And each of the parts of the eye measured fractions of the heqat. This part of the EYE represents the sprouting of the wheat or grain from the planted stalk. It is the food we put into our mouth. And so represents taste. Taste is also = Touch + Shape. That is to say, the different tastes we experience come from touching different shapes. So, touch is more a fundamental sense that taste. This is the pupil of the EYE. And so no more needs to be said. It represents seeing, or the sensation of light. This part of the EYE represents the EAR. The figure points towards the ear on the face. Also, it has the shape of a horn or musical instrument. When we Hear a sound or combination of sounds we find this to be pleasing or unpleasant. The sound has a taste for us, causing a preference. Sound requires Touch + Taste and so is a combination of the lower senses. Horus, the son of Osiris and Isis, was called "Horus who rules with two eyes." His right eye was white and represented the sun; his left eye was black and represented the moon. According to myth Horus lost his left eye to his evil uncle, Typhon-Set (or Seth), whom he fought to avenge Seth's murder of Osiris. Seth tore out the eye but lost the fight. The eye was reassembled by magic by Thoth, the god of writing, the moon, and magic. Horus presented his eye to Osiris, who experienced rebirth in the underworld. The Elohim transfer the divine image into proper seed forms of the Shekinah creation which are reprogrammed and regenerated by the Eye of Horus placed upon the face of the elect who are the Brothers. 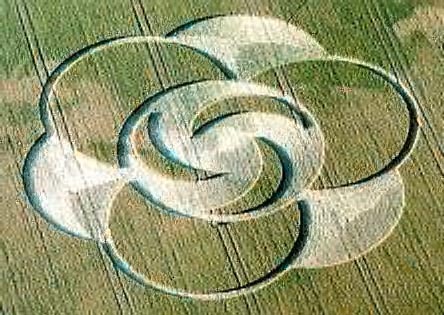 It appears to me, that showing us the crop glyphs of the opening eye, that we are now in this age and we 'are' the elect ... those who see and understand. My eyelids were aching so I looked in the mirror. I touched my eyelids with my fingers and saw that my eyelids had become detached from my body and were about to fall off. I carefully held them in place despite the pain because if I didn't, I'd never be able to close my eyes again and I'd see more than I wanted to from now on. Some days I feel like that, but fortunately, not all the time. 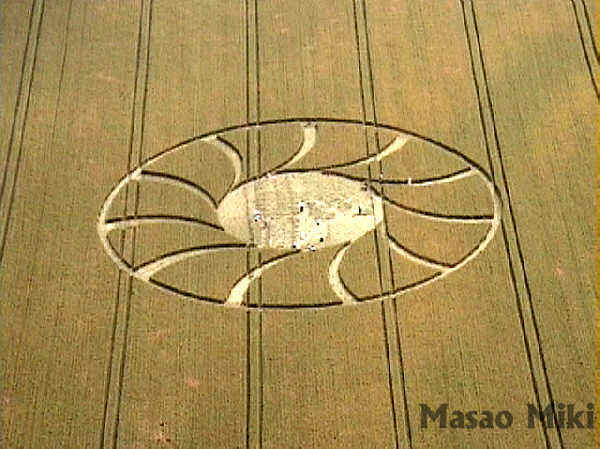 1994 - created by an unknown source on July 19/20, 1994 at the east field of Alton Barnes, UK. It was 3 trams lines wide. Most dowsers found various energy lines. An anomalous light was reported in the area of the formation. See how small the people are in comparison in the center of the eye. 1994 - By the size of the people standing in this formation, gives an idea of the size comparison. The center detail of this formation was made of thin lines forming a double-diamond round 'pupil' of the large elaborate Eye formation. 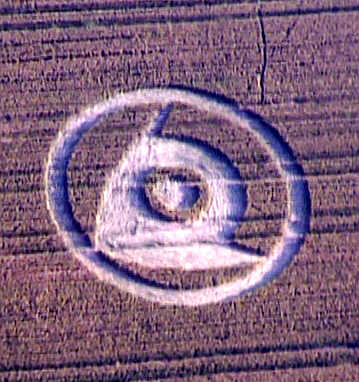 An enlarged colour photo of this Formation is contained in the 1993 CropCircle calendar. 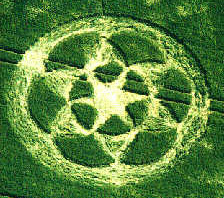 Actually, I see this "turtle" Pattern as one of the CircleMakers' "practice forms". 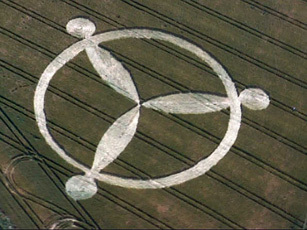 We had not seen the Vesica Pisces (eye) shape in the fields before. The CircleMakers already knew how to design Circles and Paths [of which the "turtle's feet" suggest the beginnings], for they'd transmitted many in the past; but the Vesica was new in '91. 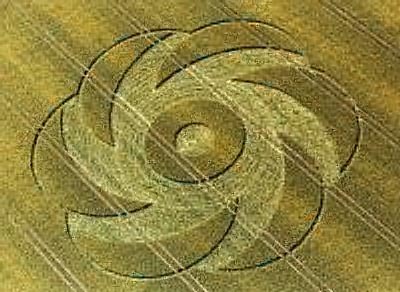 Over the years there have been several examples of what appear to be their "practice" Formations, precursors to the major Transmissions in which a novel or complex shape or lay is involved. 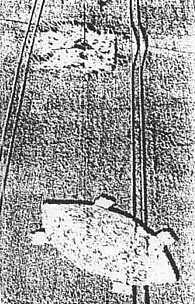 This Vesica Pisces form did, in fact, arrive twice more that same year, on the Avebury Avenue and at Firs Farm. In both, the "Turtle's feet" had mutated into Rings. Another example: the previously referred to Overton Oval at West Overton [England '93] appears to have been preceded by a "practice Oval". Gothic is a term relating to the Middle Ages or medieval and the architectural style prevalent in western Europe from the 12th through the 15th century as characterized by pointed arches, rib vaulting, and flying buttresses. Other items of interest is the piscina a stone basin with a drain for carrying away the water used in ceremonial ablutions. It is derived from the Latin, fish-pond, pool, from piscis, fish. Another is the miter the liturgical headdress and part of the insignia of a Christian bishop. In the Western church it is a tall pointed hat with peaks in front and back, worn at all solemn functions. It was also the ceremonial headdress worn by ancient Jewish high priests. The word is derived from Middle English mitre, from Old French, from Medieval Latin, from Latin mitra, headdress of the Jewish high priest, and from the Greek. So, why is this so interesting? Because we are in the process of changing over from the Age of Pisces to the Age of Aquarius, which we've written extensively on in the past few years. Quran 24:35 - This psychic structure of the soul has been expressed by Ghazali in an esoteric commentary upon the Verse of Light (Quran 24:35).The niche, as a place of gathering of both sound and light in the outer world, is also a place of gathering inwardly for all sensory perceptions. A focus point, an aperture in the wall, it symbolizes the first inner aspect of the soul, common sense. The glass symbolizes the second, imagination, which like glass is part of the materiality of this world and has a definite dimension; like glass in is making, imagination is at first opaque to the light of the Intellect which transcends direction, quality, and distance. Once the imagination is clarified and refined, it gains a similarity to the Active Intellect, or spiritual Heart, and becomes transparent to the light, just as a glass is needed to protect the candlelight from being dissipated by the wind, so the imagination is needed to control intellectual knowledge and hold the images together. 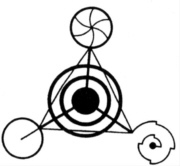 In September of 1990, Joe Mason had a dream with the following symbol and a dream-voice message: Sept.90 - "The interlocking rings are an aperture, as on a camera." 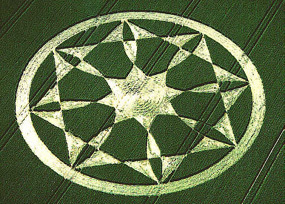 This year, a six-petal pattern appeared with smaller circles around the major one, which produced a Star Of David in the center. 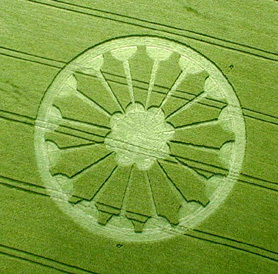 A strong clue, as I see it, of the aperture opening, and the leap to the Heart Chakra by humanity en mass. It seemed to be a description of the meaning of the Barbury formation. 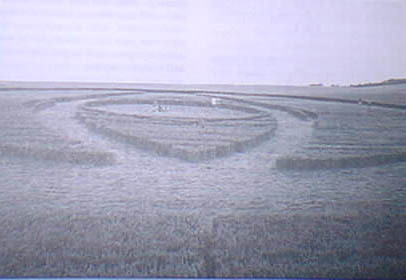 The six lines in the north sun symbol had the wheatstalks pointing inward toward the center. The "ratchet" or Mercury spiral had six steps flowing from the center to the Southeast corner of the triangle. I had a dream voice message prior to this, saying that we were still apes; that the great cycle was not over yet; that we would become Man at the end of the cycle. Not long after this, I was waiting in line at a convenience store, and picked up a tabloid. I flipped to a story about a supposed miracle in Italy. A pilot, taking some Catholic nuns on a mercy mission died of a heart attack. The plane flew the 100 miles by itself, and landed, surrounded by light. The seven nuns stepped out unharmed. It struck me - the Pleiades are called "The Seven Sisters." I don't know if the story is true, but it was quite a coincidence, and I pay attention to such things. I looked up "Pleiades" in the dictionary. They are the daughters of Atlas and Pleione, placed by Zeus among the stars. Six are readily visible, while the dimmer seventh is called, "The Lost Pleiad." or Native American. They said, "Native American." the family of women, and she would be easily assimilated. my husband will retire, and we will own the bank." I was overwhelmed with emotions when I head the dream. It seemed to verify by "coincidence" that the concepts were valid. The Father retiring seemed to indicate the "rest" on the Seventh Day. Looking closely, there are 3 extra single petal-edges between the completed petals perhaps suggesting a 12 petal design. There is a mark to the upper right of this glyph which the photographer cut off the picture. It appears to be an 'eye' antenna such as part of the 'eye of Horus'. This was the first flower of the season. There are two marks above and to the right of it that look like a bird flying. It's become obvious to me that we are being led step by step in a learning curve. The crop glyphs are becoming more and more numerous in an ever widening number of countries and they are becoming more and more complex. 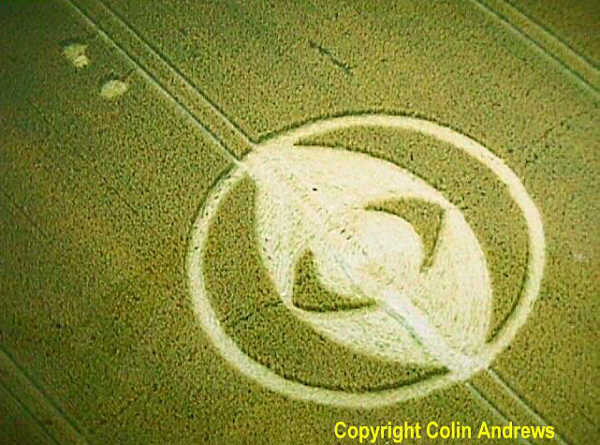 We just need to be able to analyze them and see what the message is that the crop glyph makers are trying to tell us.